Hundreds of mourners gathered in Liverpool for the funeral of Sir Ken Dodd's, following the comedian's death at the age of 90 earlier this month. Fans lined the streets outside his home in Knotty Ash as his funeral cortege left and travelled to Liverpool Cathedral where the funeral was held. Sir Ken's coffin was taken to the cathedral by a horse-drawn hearse, a nod to his father's job as a coal merchant. 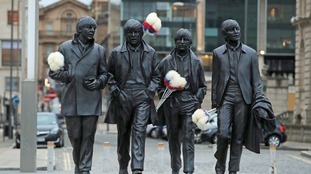 The comic's trademark tickling sticks were placed around Liverpool landmarks ahead of the service, including on the town hall and a statue of The Beatles at the Pier Head. Many Liverpool comedians and celebrities were among mourners to pack out the cathedral, including Jimmy Tarbuck, Les Dennis, Tom O'Connor and Stan Boardman. "You can't compare anyone with Doddy. "He inspired everyone in Liverpool and that's why so many people are here today, they loved him." "The lights are dimmed, the curtains closed on his wonderful world of variety. "Ken Dodd was, no contest, the complete comedian, our greatest entertainer. But he was more. He was a life-enhancing force of nature." He ended by saying: "We'll never see the like of Ken Dodd again. Thank you Sir Ken, tatty bye." In the order of service from the funeral was a "specific request" from Sir Ken that donations be made to the homeless. The funeral service was open to the public, with a large screen broadcasting the ceremony for mourners outside the cathedral. Flags at Liverpool Town Hall, St George's Hall, Cunard Building and Central Library were lowered for the day as a mark of respect. Lord Mayor of Liverpool, Councillor Malcolm Kennedy, said: "Although Wednesday will be a sombre occasion, it is an opportunity for us all to pay tribute to an unforgettable man and I can think of nothing more fitting than huge crowds lining the streets for his final act. "There will never be another comedian like Ken, his passing marks the end of an era in British entertainment and I'm sure he'll be tickled that the city will be putting on such a show in his honour." The funeral service was followed by a private interment.